The business began in 1894 with my fathers’ grandparents who came to England from Dusseldorf, Germany. They first settled at Riseley, Bedfordshire where my great grandfather Peter began with a horse and cart delivering fruit and vegetable. The business did well and they eventually bought shops in Kettering, Bedford and Rushden. On the death of my great grandparents the business was split. The Kettering shop went to Franz Fett, the Bedford shop to Kasper Fett and the Rushden shop to Peter Fett (my grandfather). Peter continued with the fruit and vegetable business in Station Road, Rushden (then in the old RAF Club opposite Cyril Freeman’s garage), then moved to 10 Wentworth Road, in 1922, where there was a large house and a warehouse to hold the produce. The shop at 103 High Street was opened by my grandparents in the mid 1930s. 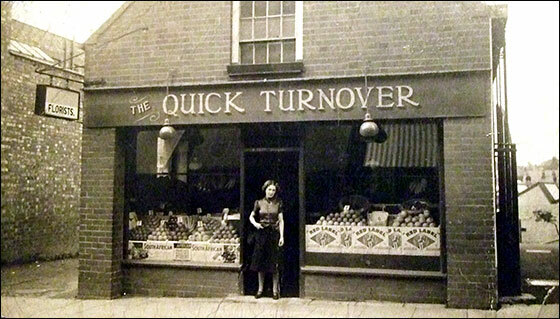 They first rented the premises, but after WWII they bought the property and traded as The Quick Turnover”. Later my father, Peter Fett became a director of the business with his parents. On the death of his father, my father renamed the shop M Jones & Sons, and continued until he retired in 1983. The business was sold to Dave Seabrook who continued the fruit and vegetable and also sold flowers.